With a Ph.D.-student-to-faculty ratio of 3.8-to-1 (U.S. News and World Report, 2018), the Department of Biomedical Engineering (BME) at UC Davis offers a wide range of opportunities to explore the discipline and work with world-class researchers while pursuing your graduate degree. 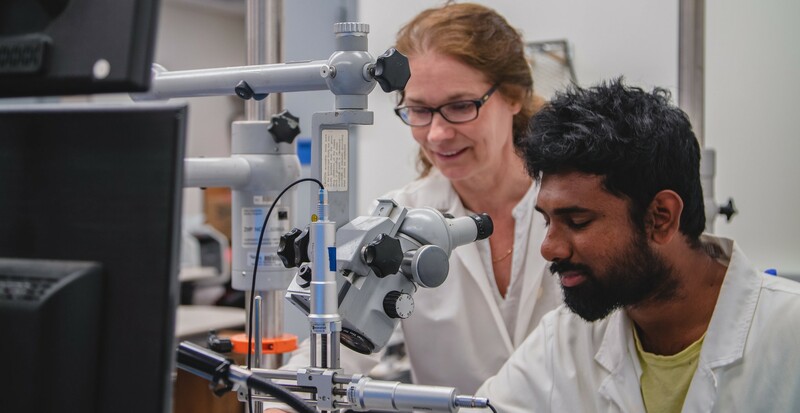 As a graduate student interested in biomedical engineering projects, you have the opportunity to work with diverse faculty across many different departments at the UC Davis main campus, the School of Veterinary Medicine and the School of Medicine. Your diploma will reflect the discipline of the graduate program or graduate group that you enroll with. Professor Karen Moxon and Ph.D. student Bharadwaj Nandakumar. If you are interested in obtaining an M.S. or Ph.D. degree in biomedical engineering, you should apply to the Biomedical Engineering Graduate Group (BMEGG). The BMEGG uses the graduate group structure to capitalize on the expertise of faculty from diverse disciplines and support collaborative research. The BMEGG has an administrative home in the BME department, but faculty in the group come from departments across campus, including the UC Davis School of Medicine (35 percent). Biomedical engineering department faculty can be members of other graduate groups, so you may pursue graduate study with department faculty through a number of other graduate groups including Biochemistry, Molecular, Cellular and Developmental Biology; Biophysics; Chemistry; Immunology; Mathematics and more.